Here at Lucid, when you hear the gong, you know a big deal was just closed. And you know the sales floor is about to go crazy. You could say it’s the final, and definitely the most enjoyable, step in our sales process. But there’s a lot that goes on before that beautiful sound, and in order to really make the gong ring, you need to establish an effective sales process capable of scaling at the same rate your company is. That can be hard to do and daunting to tackle. But you have to start somewhere, which is why we’ve got a quick and dirty guide to a successful sales process so the gong-ringing at your company can reach a whole new decibel. Just looking to build your own sales process? 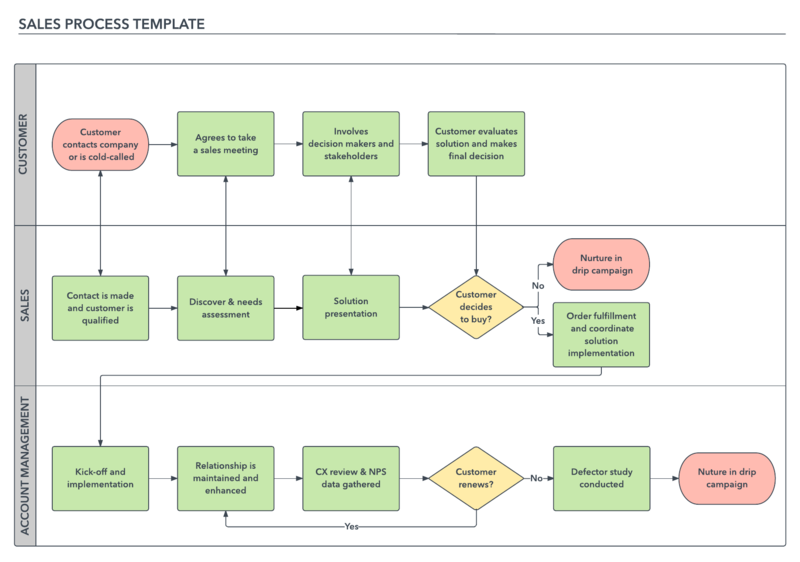 Start with our handy sales process template and customize it for your sales team. The sales process consists of the systematic steps your sales team takes to move a prospect from the early stages to a closed deal. It’s largely about developing a relationship with the customer as you ask questions, educate them, and provide value. The process generally follows the same pattern at any organization, and each step is essential for a successful sale. Keep in mind that a sales process is different from a sales methodology. While the process is a high-level overview of the steps to be completed in a sale, the methodology guides the approach a salesperson takes in executing these steps. There are a variety of sales methodologies your team can use, including challenger selling, solution selling, consultative selling, and inbound selling. 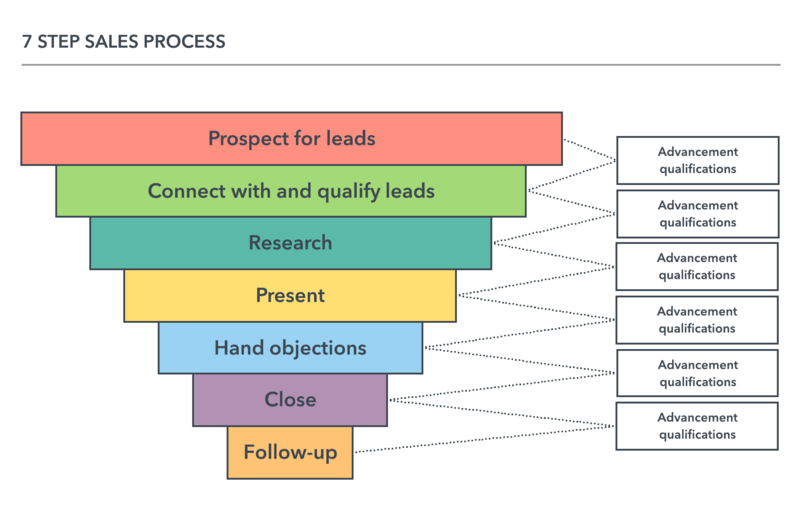 Let’s take a look at the steps in an effective sales process. This first stage of a sales process is all about identifying new potential customers. Research online or dive into existing databases. This step should really be ongoing for every member of the company—always be on the lookout for new prospects, on or off the job. As part of this preparation step, remember that you can’t assume that a potential customer can automatically link features to benefits—it’s your job to make sure the connection is crystal clear. Make sure you know how customers benefit from product features; in other words, always be thinking of features in terms of the “so what?”. This step prepares you to talk to customers by shifting your focus of the product from features to values. To help with this stage, you may want to profile and segment your existing customers. That way, you can categorize new leads into these segments so you know which marketing tactics are most effective for a given customer, which will make your job a lot easier later on in the process. Now that you have an idea of who to target, it’s time to make your first move. Make the first contact, which can take the form of cold calls, emails, personal visits, social media, or mail. Ensure you have a good approach, otherwise you’ll be branded as an annoying salesperson rather than someone able to provide value, and that means the door has closed before it’s even all the way open. Timing can be key in making that first contact. A study by InsideSales.com found that reps who follow up with web leads within 5 minutes are 9 times more likely to convert. InsideSales.com also found that the best days to qualify leads are Wednesdays and Thursdays, and the best time to qualify leads is between 4 and 5pm. And be persistent—always make at least 6 call attempts. Use this initial contact to determine whether or not a lead is qualified. Discover if the prospect has the necessary budget and is actually willing to spend time with a sales rep considering your product. Asking questions will both get you the information you need but also help to grab and retain a prospect’s attention (which is key considering the average buyer attention span amounts to a mere seven seconds). In order to truly provide value, you need to fully understand your prospect’s needs, wants, and desires and how your product can solve them. 70% of people make purchasing decisions to solve problems, yet only 13% of customers believe a salesperson can understand their needs. So beat the odds and start researching your customer, their company, and the competition. The best way to do so is to ask the prospect more questions. Not only will you be doing your research, but you’ll be building trust with the prospect and helping them identify new pain points they may not have even considered. In addition, you’re gathering the ammo necessary to provide a customized experience throughout the rest of the sales process. Here are just a few examples to help you get started. What do you like best about your current supplier? What do you like least? What do you like best about your current system? What would you like changed? Do you struggle with [common pain point]? What is your success criteria? If you could change one thing about your organization, what would it be? How many customers do you hope to gain this year? What is the most important goal of your marketing? This stage of the sales process consists of a formal presentation or demo of your product. Remember—sell value, not features. We can’t emphasize that enough. Now is the time to whip out that research—address their needs and outline why your product is the solution they’ve been looking for (bonus points if you become the solution they didn’t even know they needed). Rely on the needs assessment to make sure your presentation reflects the prospect’s perspective rather than your own, and make it interactive and tailored to the buyer. As you’re preparing your presentation, remember to use visuals. The human brain processes visuals 60,000 times faster than text. Visuals grab attention and make any idea easier to understand—remember, a picture is worth a thousand words. Lucidchart makes it easy to create professional and compelling visuals that will both spice up and add clarity to your presentation. Undoubtedly, your prospect will have some concerns. Although this may be a frustrating step in your sales process, keep in mind that objections can actually be a good omen—a prospect wouldn’t be trying to work out potential problems if they weren’t at least considering buying. Make sure all your prospect’s questions are answered so that you are properly set up to go in for the close. 80% of sales are lost due to a salesperson failing to close. So this step in the sales process is crucial. You’ve done all the work—now it’s time to seal the deal. Activities in this stage vary from company to company but may include delivering a quote or proposal, negotiating, achieving buy-in from decision makers, etc. Don’t ever leave a sales conversation without ensuring you and your prospect have agreed on next steps. There are infinite ways to close a sale, but it ultimately boils down to the fact that you need to make the ask while gauging how aggressive you can be. Here’s a quick look at just a few closing techniques. If-Then Close: “If I could demonstrate how this product provides you with (values based on needs assessment), would you be willing to (demo, buy, switch, etc)?" After closing the deal, resist the temptation to bolt out of fear that the prospect will change their mind. Instead, make the effort to stay in touch with the customer—you may see rewards down the line. Retaining current customers costs six to seven times less than acquiring new ones, and increasing customer retention rates by 5% increases profits by 25-95%. There are many ways to continue the conversation, such as sending newsletters and product updates or engaging on social media. In maintaining the relationship, you are opening doors for yourself—you can set the stage for repeat buying so that when their uncle, sister, son, or boss also needs your solution, you’ll automatically be the point of contact. The best sales process ensures the relationship endures beyond the final handshake. Click the image to open in Lucidchart. So how do you go about developing a sales process solution for your own organization? Well you’ve already got a pretty good template just by using the steps outlined above. There are a few things you can think about to help customize those steps for your organization. Start by gathering examples of recently closed deals at your organization. Determine the major steps and customer touch points involved, the length of the entire process, and the time between steps. Based on what you observe from these past deals and the steps we outlined above, create a generic example to serve as a starting point for your own sales process. For every stage that you define in your model, make sure you can clearly explain why and how a prospect moves from one stage to the next. Don’t leave this open to interpretation—make sure your reps are clear on what the triggers are. You also need to think about how you will measure the success of your sales process. Identify the key metrics you need to track at each stage, such as how long a prospect stays in a given stage or how many prospects move through a given stage in a certain time period. Building a sales process is not a one-and-done activity. It will evolve as your team becomes more experienced and efficient. Always be revising and updating your process based on feedback from your team and the results you see. Once you’ve got a defined sales process, it needs to live somewhere. We recommend a visual format such as a flowchart. 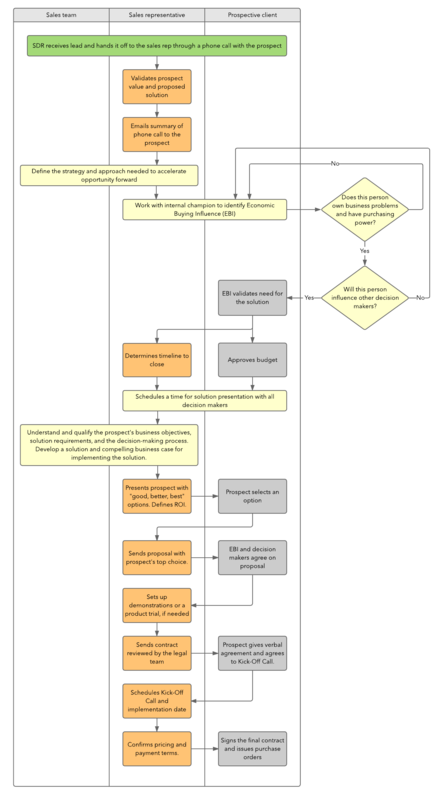 Communicating a process through a flowchart is far more effective than doing so with blocks of text. A visual makes it so much easier for your team to digest and understand the process. In fact, sales teams report that using Lucidchart saves them nearly five hours of time in their sales process and makes them 40% more productive. You can use Lucidchart to easily create a polished sales process map that you can share with your entire team. 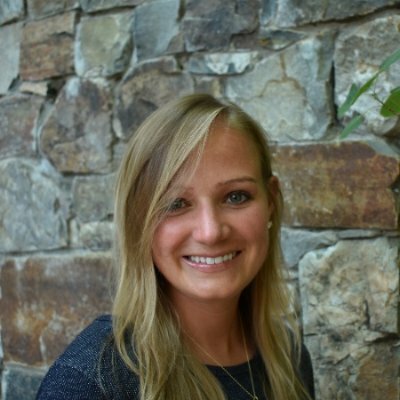 And that’s not just a shameless plug—our own sales team uses Lucidchart to build and maintain their own processes, which involve the sales team, deal desk, accounting department, and customer success team. Using swimlanes, each of these involved parties has clearly defined steps. Mapping our process helps us spot inefficiencies and revise on the fly. If your biggest hangup is that blank canvas staring back at you, try starting with one of our sales process templates and tailoring it to fit your organization. For further inspiration, learn more about building a sales process from our senior management of sales enablement. Or check out how mapping one of our sales process resulted in thousands of leads. So give it a shot—define your own sales process and make that gong ring!